STEM Lab's make learning fun - Kitty's Book Spot! This manual helps with aiding in the teaching of Science, using a new way of helping the kids absorb. 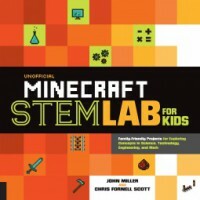 While the STEM system is not new, this book shows with 48 projects just how computer games and education can be combined. If you have not seen this series, you are in a for a treat. The author's still observe some basics. They encourage the use of a journal. Using the popularity of the video game Minecraft, users can gain scientific knowledge. Making fun things like glow in the dark items to fireworks. I loved the lab that was able to be crafted. Harness the widely enjoyed video game to bring education to students. This is such a great idea, and a very usable concept. I was actually excited and at the end, hoping for more projects. Maybe there will be a volume 2? I give this guide a 4/5 Kitty's Paws UP! ***This early copy was given in exchange for an honest review by Netgalley and its publishers only.